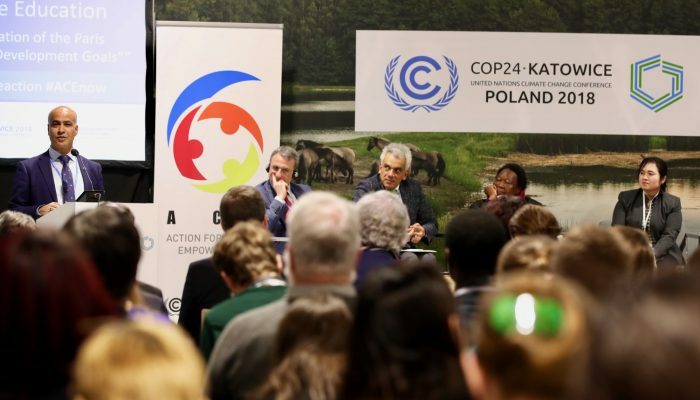 Earlier this month, the 24th Conference of the Parties (COP24), was held in Katowice, Poland. COPs are held annually and provide world leaders, policy workers, scientists and industry leaders with the opportunity to negotiate and determine how best to tackle climate change and reduce emissions on a global level. With so much at stake, these negotiations can be tense. Some COPs see more action than others. COP24 had relatively high stakes with delegates having to establish a rulebook that will allow the 2015 Paris Climate Agreement to be put into practice in 2020 . The Paris Climate Agreement was established during COP21. It acknowledges climate change as an international threat and that preventing the Earth’s temperature from rising 2°C above pre-industrial levels should be a global priority. Creating a rulebook that will instruct countries on what they must do to achieve this is no easy feat. This blog will give you some details about what was achieved at COP24, and perhaps more importantly, what wasn’t. But firstly, it will outline what it’s actually like to attend a COP with some personal insights from Sarah Connors, Intergovernmental Panel on Climate Change (IPCC) Science Officer and former EGU Policy Fellow. Then there’s load of other events going on around the city, hosted by NGOs and charities. There’s also the occasional protest. It all felt a bit disjointed at times actually – not sure that’s a good thing. So… What did the COP24 achieve? The rulebook, which was the key task of COP24 and which will be used as an operating manual after 2020 was, for the most part, agreed upon. This is a positive step because, as UN Secretary General António Guterres, states “A completed work programme will unleash the potential of the Paris Agreement. It will build trust and make clear that countries are serious about addressing climate change” . From 2024, all countries will have to report their emissions (and progress in reducing them) every two years. However, instead of requiring countries to adhere to a single, scientifically sound method of reporting their emissions, the text permits countries to use “nationally appropriate methodologies”. This could result in countries under-reporting their emissions with the land use sector being particularly susceptible to creative accounting . A number of countries pledged to increased their climate pledges in 2020, including: the EU, UK, Argentina, Mexico, India, Canada, Ukraine and Jamaica. Some large private sector companies also made ambitious pledges including Maersk, the world’s largest shipping company, which pledged to eliminate its carbon impact by 2050. The IPCC’s Special Report on Global Warming of 1.5ºC wasn’t fully embraced: Although the vast majority of national representatives wanted to “welcome” the report which was commissioned as part of the Paris Agreement, the US, Russia, Saudi Arabia and Kuwait only wanted to “note” the report. This resulted in a watered-down statement which welcomed the “timely completion” of the report and “invited” countries to make use of it. Although this may seem like semantics, it demonstrated the differing levels of engagement in climate action that countries are willing to have and pressed the issue of whether new legislation is effectively using the scientific evidence commissioned by policymakers. Lack of clarity on climate finance: During the Paris Climate Agreement, donor nations committed to mobilising $100 billion annually from 2020 to fund climate action in developing countries. Not only is it uncertain whether donor countries will be able to reach this contribution target by 2020, but there is a lack of clarity as to what constitutes “climate finance”. Can countries report aspects of their development add as “climate action aid” or should this be separated? What are the impacts of this? No agreement on Article 6, voluntary carbon markets: The final decision on Article 6 which sets the rules for voluntary carbon markets (such as carbon credits) will be made during COP25 next year. Carbon credits are given to countries based on their emissions-cutting efforts and carbon sinks, subsequently helping countries to meet their emissions targets. During the COP, Brazil pushed for a change in the wording of the final document which would have allowed each party in the carbon credit trade to make a “corresponding adjustment” to their emissions inventories. There was concern that this clause may allow countries to “double count” the emissions traded and as a result a final decision was not agreed upon this year. 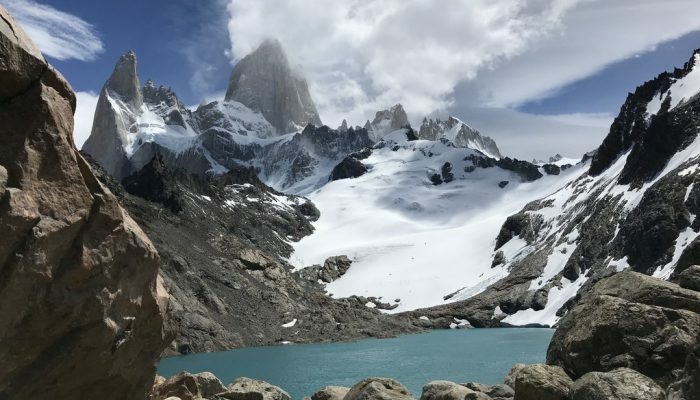 COP25 will now be held in Chile rather than Brazil after Brazil’s president-elect Jair Bolsonaro reneged on hosting the event. During this meeting the final elements of the Paris rulebook will be finalised and work will begin on emissions targets for 2030 and beyond. Scientists made a detailed “roadmap” for meeting the Paris climate goals. It’s eye-opening. Geotalk is a regular feature highlighting early career researchers and their work. 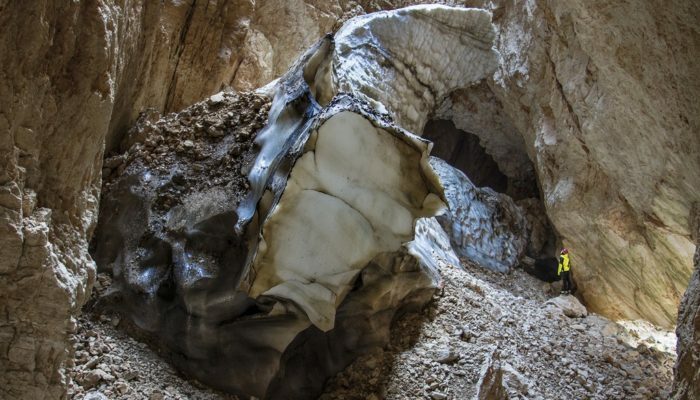 In this interview, we caught up with Christo Buizert, an assistant professor at Oregon State University in Corvallis, who works to reconstruct and understand climate change events from the past. 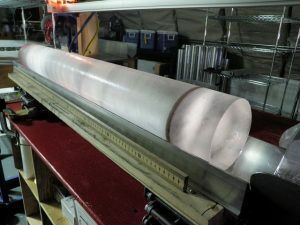 Christo’s analysis of ice cores from Greenland and Antarctica helped reveal links between climate change events from the last ice age that occurred on opposite ends of the Earth. 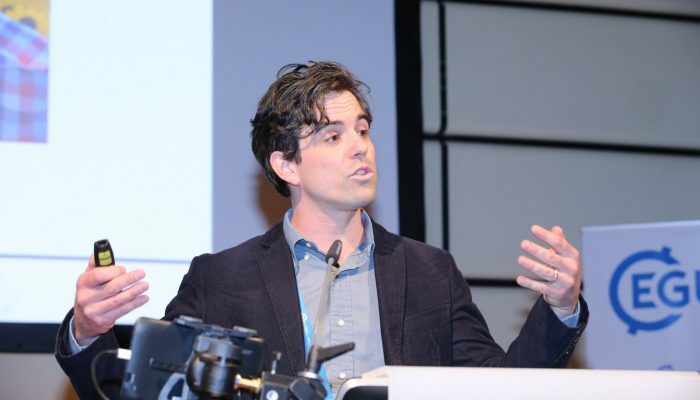 At this year’s General Assembly, the Climate: Past, Present & Future Division recognized his innovative contributions to palaeoclimatology by presenting him with the 2018 Division Outstanding Early Career Scientists Award. Christo, thank you for talking to us today! Could you introduce yourself and tell us about your career path so far? Thanks for having me on GeoTalk! I’m a palaeoclimate scientist working on polar ice cores (long sticks of ancient ice drilled in Greenland and Antarctica), combining data, modeling and fieldwork. My background is in physics, and I did a MSc thesis project on quantum electronics. As you can see, I ended up in quite a different field. After teaching high school for a year in my home country the Netherlands, I pursued a PhD at the Niels Bohr Institute in Copenhagen, Denmark, working on ice cores. I must say, doing a PhD is a lot easier than teaching high school! I have gained a lot of respect for teachers. After obtaining my PhD I moved to the US for reasons of both work and love (not necessarily in that order). I got a NOAA Climate & Global Change Postdoctoral Fellowship at Oregon State University (OSU). OSU has a great palaeoclimate research group and Oregon is one of the prettiest places on Earth, so the decision to stick around was an easy one. What inspired you to pursue palaeoclimatology after getting your MSc degree in quantum electronics? I wish I had a better answer to this question, but the truth is that I was drawn by the possibility of doing fieldwork in Greenland, mainly. 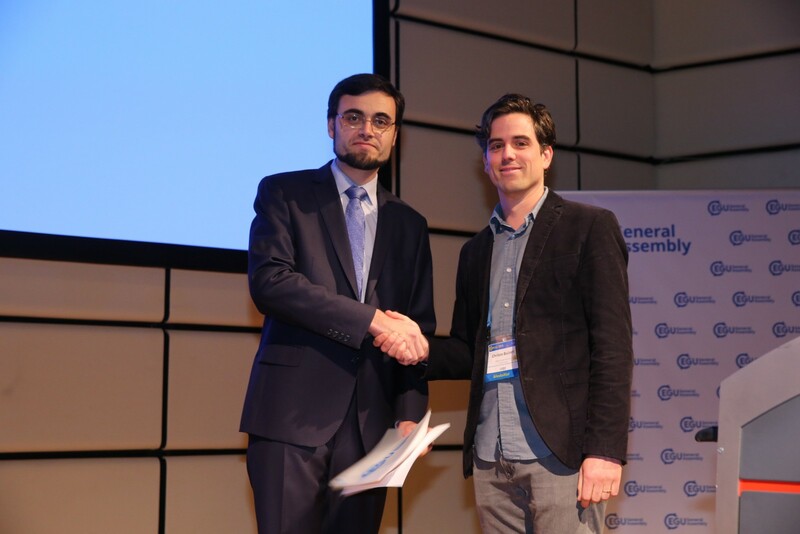 At the General Assembly, you received a Division Outstanding Early Career Scientist Award for your work on understanding the bi-polar phasing of climate change. For those of us who aren’t familiar, could you elaborate on this particular field of study? During the last ice age (120,000 to 12,000 years ago), the world experienced some of the most extreme and abrupt climate events that we know of, the so-called Dansgaard-Oeschger (D-O) events. About 25 of these D-O events happened in the ice age, and during each of them Greenland warmed by 8 to 15oC within a few decades. Each of the warm phases (called interstadials) lasted several hundreds to thousands of years. Greenland ice cores provide clear evidence for these events. The abrupt D-O events are thought to be linked to changes in ocean circulation. Heat is transported to the Atlantic Ocean by the Atlantic Meridional Overturning Circulation (AMOC) from the southern hemisphere to the northern hemisphere. The AMOC keeps the Nordic Seas free of sea ice and effectively warms Greenland, particularly during the winter months. However, the strength of this heat circulation went through abrupt changes during the last ice age. 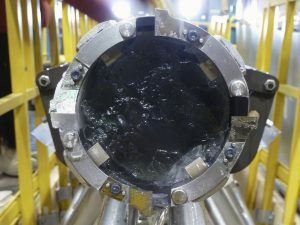 Marine sediment data and model studies show that changes to the AMOC strength caused the extreme temperature swings associated with the D-O events. During weak phases of the AMOC, less heat and salt are brought to the North Atlantic, leading to expansive (winter) sea ice cover and cold conditions in Greenland. These are the D-O cycle’s cold phases, the so-called stadials. And vice versa, during the AMOC’s strong phases, the ocean transports more heat northwards, reducing sea ice cover and warming Greenland. These are the warm (interstadial) phases of the D-O cycle. When the AMOC is strong, it warms the northern hemisphere at the expense of the southern hemisphere. This inter-hemispheric heat exchange is sometimes referred to as ‘heat piracy,’ since the North Atlantic is ‘stealing’ heat from the southern hemisphere. 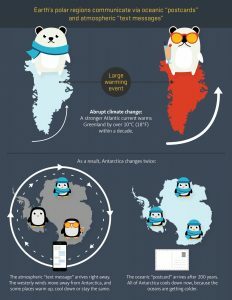 So when Greenland is warm, we see Antarctica cool, and when Greenland is cold, Antarctica is warming. These opposite hemispheric temperature patterns are called the bipolar seesaw, after the playground toy. Using a new ice core from the West Antarctica Ice Sheet (the WAIS Divide ice core), we were able to study the relative timing of the bipolar seesaw at a precision of a few decades – which is extremely precise by the standards of palaeoclimate research. 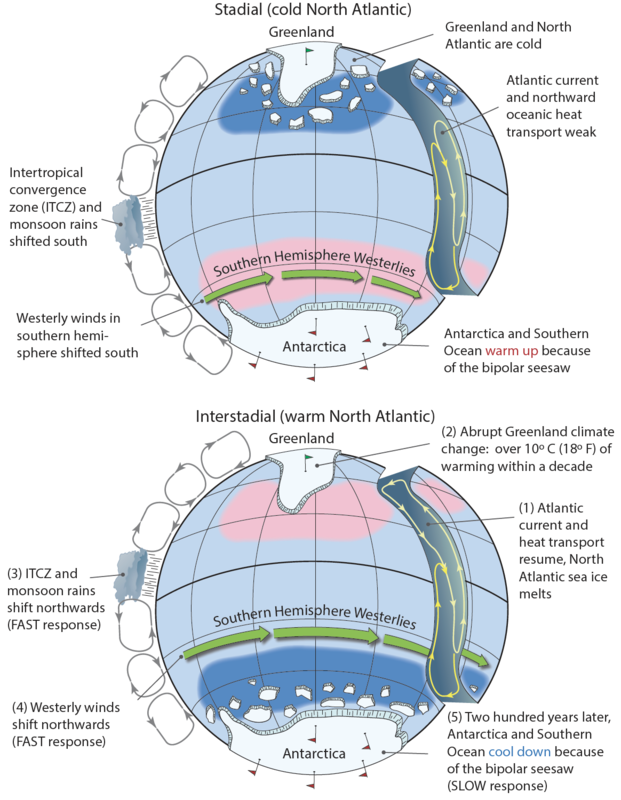 An infographic explaining the opposite hemispheric temperature patterns, also known as the bipolar seesaw (Illustration by David Reinert/Oregon State University). We found that the temperature response to the northern hemisphere’s abrupt D-O events was delayed by about two centuries at WAIS Divide. 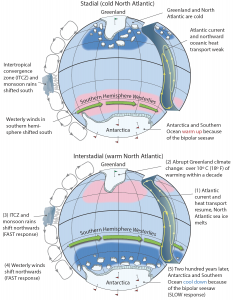 This finding shows that the effects of these D-O events start in the north, and then are transmitted to the southern high-latitudes via changes in the ocean circulation. If the atmosphere were responsible, transmission would have been much faster (typically within a year or so). State-of-the-art climate models actually fail to simulate this 200-year delay in the Antarctic response, suggesting they are missing (or overly simplifying) some of the relevant physics of how temperature anomalies are propagated and mixed in the global ocean. The timescale of two centuries is unmistakably the signature of the ocean, in my view, and so it is an interesting target for testing models. At the meeting you also gave a talk about the climatic connections between the northern and southern hemispheres during the last ice age. Could you tell us a little more about your findings and their implications? I presented some recently published work that elaborates on this 200-year delay mentioned earlier. Together with European colleagues, we synchronized five Antarctic ice cores using volcanic eruptions as time markers. This makes it possible to study the timing of the seesaw across the entire Antarctic continent with the same great precision as at WAIS Divide. It turns out that the 200-year delayed oceanic response to the northern hemisphere’s abrupt climate change is visible all over Antarctica, not just in West Antarctica. But the exciting thing is that by looking at the spatial picture, we detect a second mode of climatic teleconnection, superimposed on the bipolar seesaw we talked about earlier. This second mode has zero-time lag behind the northern hemisphere, suggesting that this mode is an atmospheric teleconnection pattern. In my talk I used postcards and text messages as an analogy for these two modes. The oceanic mode is like a postcard, that takes a long time to arrive in Antarctica (200 years). The atmospheric mode is like a text message that arrives right away. The atmospheric circulation change (the “text message”) causes a particular temperature pattern over Antarctica, with cooling in some places and warming in others. Think of this as the “fingerprint” of the atmospheric circulation. We then compared the ice-core fingerprint to the fingerprints of several wind patterns seen in modern observations. We found that the so-called Southern Annular Mode, a natural mode describing the variability of the westerly winds circling Antarctica, is the best modern analog for what we see in the ice cores. Another piece of the puzzle is that atmospheric moisture pathways to Antarctica change simultaneously with the atmospheric mode. All this supports the idea that the southern hemisphere’s westerly winds respond immediately to abrupt climate change in the North Atlantic. When D-O warming happens in Greenland the SH westerlies shift to the north, and vice versa, during D-O cooling they shift to the south. This had been predicted in models, and some limited evidence was available from the WAIS Divide ice core, but the new results provide the strongest observational evidence for this effect. This movement of the westerlies has important consequences for sea ice, ocean circulation, and perhaps even CO2 levels and ice sheet stability. So it really urges us to look at these D-O cycle in a global perspective. You’ve enjoyed success as a researcher, not least your 2018 EGU Award. As an early career scientist, do you have any words of advice for graduate students who are hoping to pursue a career as a scientist in the Earth sciences? I’m sure there are many different routes to becoming a successful researcher. Developing your own ideas and insights is key, and the secret to having good ideas is having many ideas, because most of them end up being wrong! So be creative and go out on a limb. I am lucky to have had supervisors who gave me a lot of freedom to explore my own ideas. I would also encourage everybody to develop skills in programming and numerical data analysis, for example in Matlab or python. Christo Buizert (right) and Didier Roche, President of the Climate: Past, Present & Future Division, (left) at the EGU 2018 General Assembly (Credit: EGU/Foto Pflugel). Frustrating and unfair as it may be, luck plays an important role in getting your research career started. My main PhD project did not work out, but I had a very productive postdoc that grew out of a side project. I ended up in the right place at the right time, because the WAIS Divide ice core had just been drilled, and I got the privilege to work with some of the best ice core data ever measured. Research is fundamentally a collaborative enterprise, and so developing a good network of collaborators is maybe the most important thing you can do for yourself. Be generous and helpful to your colleagues, and it will be rewarded. A career in science sometimes feels like a game of musical chairs, with fewer and fewer positions available as you go along. But if you can hang in there it’s definitely worth it; we have the privilege of thinking about interesting problems, traveling to beautiful places, all while interacting with a global network of fantastic colleagues. Could it get much better?